Buy through MusicWeb for £12.00 postage paid World-wide. Paganini would be appalled. When they were published in 1820 as his Op. 1 I’m sure he had no inkling how these 24 Caprices would, in less than 200 years, go from being his sovereign domain - could anyone else in the world except him play them at the time? - to being a staple of every self-respecting violin virtuoso. To the point now where they regularly appear as required pedagogical works on the syllabuses of the major music conservatories. That being said they still remain one of the musical Everests for violinists - many might attempt the foothills but few can be said to have conquered the peaks. This is James Ehnes’ second traversal of these 24 Caprices Op.1. The last time was over a decade ago on Telarc and was this Canadian violinist’s breakthrough disc. I have not heard that recording so I cannot comment on why he has returned to this repertoire. All I can say is that this CD contains some of the most jaw-droppingly breath-taking violinistic fireworks you are ever likely to hear. This review will become a list of superlatives and I’ll be reaching for my thesaurus before long to find another word for extraordinary. But to back-track a little first to give some context to the work. Ehnes supplies a really well-written liner-note and the opening paragraph says it all; “The defining work from the man who represented, in the words of Robert Schumann, ‘the turning point in the history of virtuosity’, Nicolò Paganini’s set of 24 Caprices for solo violin remains not only the yardstick by which all violinists are still measured, but also the most enduring, influential and fascinating work from one of the most admired musicians of the early romantic age.” On a purely personal level I have never enjoyed these Caprices as much as some of the other great cornerstones of the solo violin repertoire - they have little of the musical depth of the Bach Sonatas & Partitas or (for me) the fascination and mystery of the 6 Sonatas for Solo Violin by Ysaye. Yet one of Ehnes’ greatest triumphs is that he is able to focus on the musical impetus behind the notes because the technical hurdles that face the rest of us barely seem to bother him. In doing so he raises their musical stature greatly. I have heard ‘wilder’ performances and of course, given the nature of the music, that is a wholly valid - if somewhat wearing - approach. But for sustained listening and a greater sense of the music as an organic whole I find Ehnes to be without equal. Paganini groups the Caprices into three ‘Opera’ - numbers one and two containing six caprices each and last having twelve. There is no sense of having caprices in all the keys as Bach did with his Preludes & Fugues. Indeed Paganini revisits keys several times which shows that the music is there to service the technical effects he sought - certain keys facilitating some passages better than others. 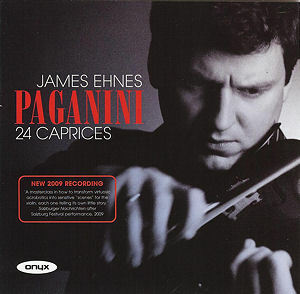 Ehnes’ note points out that the autograph copy from which the first edition was printed dates from 1817 but is not in Paganini’s hand so the dates of composition are not clear indeed the caprices lack some of the technical effects that became Paganini trade-marks later in his career. If you have ever tried to play the violin at all you will have some inkling of just how hard this music is to play at all let alone well. So the fact that there are so many recordings available of which all are technically accomplished means separating the great from the good seems almost mean-spirited on the latter. Also, how does one define greatness in terms of this type of music? Ehnes has two particular gifts - in the lyrical caprices he is able to emphasise the melodic line to the point where the ear either forgets that he is playing double trills for example (sit at a desk and try and move your left-hand first and third fingers up and down in swift even alternation with your 2nd & 4th and you’ll get the idea) with absurd speed and grace - Caprice No.3 or 6 (tracks 3&6). Now try cramp-inducing fingered octaves and tenths in the same caprice (stick your left elbow near your navel with your hand at chin height - then stretch your 1st finger as far back as possible while stretching the 4th as far forward - you’ll start to ache almost immediately - and then imagine moving up and down a violin at speed yet with total smoothness and making minor spacing adjustments the whole time). Oh yes, all the time you are doing this don’t forget about the right arm doing the bowing - which is harder to achieve than the left hand! Yet the thing I take most from this album is not the supreme technical brilliance of the playing but the beauty of the music making it serves. Curiously, I still find this music hard to listen to in a single sitting, mainly because I find myself reeling from the unending challenges it presents - it seems like the musical equivalent of fifteen rounds in the ring with a world champion but I can honestly say that Ehnes has thrown light onto it in a way I have never heard before. A word on the recording; the familiar warm acoustic of Wyastone Concert Hall (site of so many Nimbus recordings) is beautifully captured. Ehnes plays on the 1715 ‘Marsick’ Stradivarius and its extraordinary beauty is captured with a microphone position much closer than Nimbus would have had him but his technique is the equal to such attention. As a consequence you do hear intakes of breath and the violin resonating as fingers hit the fingerboard but this is only noticeable when listening on headphones and I did not find it at all distracting. Two more quick things to mention - if you want to try before you buy five of the caprices (including my own favourite No.5) are available to hear as complete streamable pieces via the Onyx website. Lastly, I love the story related in the liner-notes which I quote here; “Rossini stated that Paganini’s playing moved him to tears - one of the three occasions during which Rossini admitted to having cried - the other two involving the failure of his first opera and losing a turkey stuffed with truffles overboard on a boating expedition. A marvellous, amazing, stunning, spectacular, fabulous, awe-inspiring, fabulous - only half-way through the Microsoft office thesaurus but I’ll leave out cool and groovy - piece of music-making.